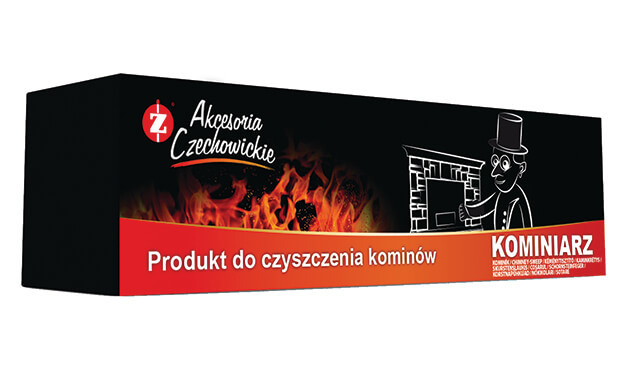 Chimney-sweep - PCC Consumer Products Czechowice S.A. The Chimney-sweep is a product that is helpful when cleaning a chimney – ensures its high efficiency and decreases the fuel source consumption. Used for fireplaces and stoves. Soot and tar accumulate during the combustion of wood. This can cause the system to clog up, reduce the efficiency of the fireplace or stove, and result in the combustion of soot and tar within the chimney. A systematic use of the Chimney-sweep reduces the consumption of wood, increases heating efficiency and reduces the risk of soot combustion. When fire reaches the inside of the product, it causes the release of active compounds, which – by accumulating on walls and ducts – cause at least most of the residue to combust completely. Directions for use: Place the product inside a fireplace or a stove, extend the ends of the packaging, light from both sides. Do not remove the product from the white paper. Use one week before mechanical cleaning. Before use, heat the fireplace well along with its ducts. It is recommended to use the product every 2-3 months on average. Composition: Compacted wooden sawdust saturated with paraffin and non-organic compounds containing copper sulphate, which is broken into substances with catalytic properties at high temperatures.